They say we adopt the qualities of the people around us, and I am no outlier. Spend enough time with someone and I’ll start talking, walking, even laughing like them. I am not alone in my copycat tendencies. Mark Twain wrote, “When a great orator makes a great speech, you are listening to ten centuries and ten thousand men.” In other words, we are but an amalgamation of our interactions and experiences. No idea is a new one, just another version of once that’s existed forever. Lucky for me, the people I’ve met along the way have been easy to admire and hence exemplars of the identity I’ve been carving out for myself in the meantime. And many many many of these people have been women. Despite my former obstinate objection toward female friends (See: “I just don’t get along with girls,” and “Most of my friends are guys”), I’ve since managed to assemble a cohort of badass lady friends who have not only taught me the ways of “Yaaas” and Taylor Swift, but have set the tone for what it means to be a strong, brave, smart young woman. These women have shown me what it looks like to stand up for yourself, to take the lead, to swallow your pride, to say no, to say yes, to say “I don’t know,” to be independent, to love others completely, to listen, to speak, to confront, to shut up, to be grateful, and to never stop asking questions. For real, I can trace each one of these talents (yes, talents) to specific real life ladies. Best of all, no one was trying to teach me a lesson. I’ve learned solely through osmosis. So, this one goes out to all my gal pals who have shown me what it means to be the best version of me. You all deserve much more than a blog post about bougie salad, but I’m giving you this because I made said bougie salad on Valentine’s Day for a gaggle of girls who came over to nibble on brunchy snacks and sip Bloody Mary’s in my living room. I was feeling the love hard that day, not only for the ridiculous nutty delicious scones Rachel made (maybe if we all beg her for the recipe she’ll share it), but in gratitude of those people who have loved me all along, long before I was the me am I am today and into the future of the me I will become. Love your friends. Love yourself. Love this salad. It’s crunchy and refreshing and great finger food for Sunday brunches, appetizer spreads, or nights at home alone where you eat dinner with your fingers. Keep your goat cheese in the fridge until just before serving – it’ll crumble much more easily that way. Combine the chopped shallot, olive oil, lemon juice, vinegar, and Kosher salt in a jar and shake well to combine. Chop the ends off the endive bulbs and separate the leaves. Rinse and dry them using a salad spinner or gently pat with paper towels. Use a large, very sharp knife to slice off the peel of the grapefruit. Cut pole to pole, just deep enough to reveal the flesh without any pith. Cut ¼ inch cross sections, and cut those sections into smaller sections. Toast the almonds in a skillet over medium heat until crispy and flavorful, about five minutes. 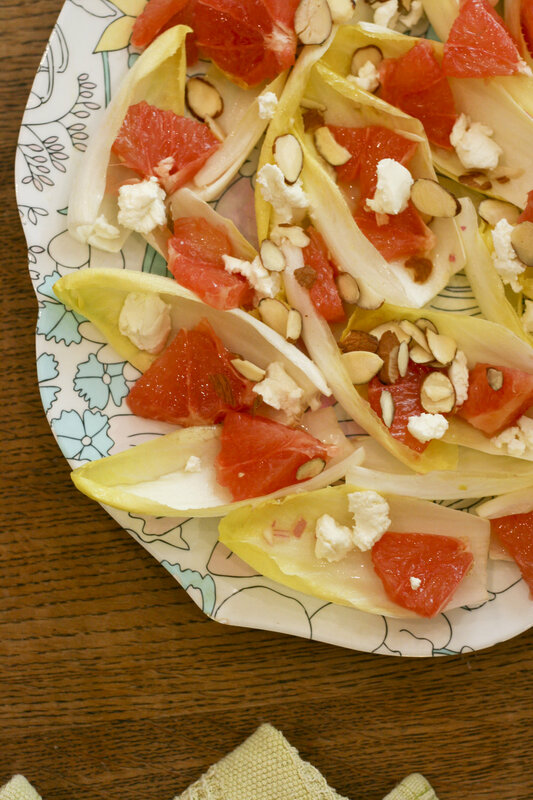 Gently toss the endive leaves and Champagne vinaigrette in a mixing bowl. Lay the leaves out on a flat platter. Top with grapefruit pieces, crumbled goat cheese, slivered almonds, and flaky sea salt. Try to scatter the toppings so they land in the little endive boats for easy serving and eating!